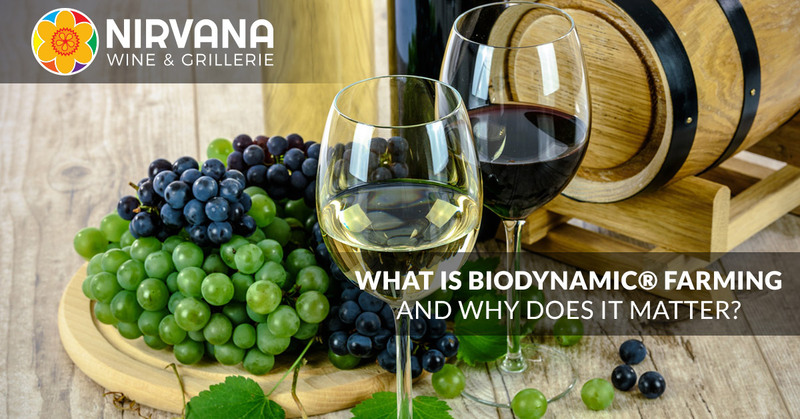 Wine Bar Vernon Hills: Just What is Biodynamic® Wine? There are so many buzzwords flying around food and wine today; between the terms sustainable, fresh, organic, superfood, and natural alone, there is plenty of room for “interpretation.” It comes as no surprise to us that, even amidst the slough of new terms and buzzwords being thrown around, that people still have little-to-no idea what makes a wine biodynamic and why that matters. Our Vernon Hills wine bar is known for sourcing our selections from small, primarily family-owned wineries that specialize in a particular type of winemaking. This commitment toward a smaller, fresher, and more particular sort of wine has made our wine bar a popular destination for enthusiasts and casual, date-night-only wine drinkers alike. Today, we’ll share the secrets behind another defining factor in many of our selections: Biodynamic farming. Biodynamic farming stems from a 1920s Austrian philosopher by the name of Rudolf Steiner; it was his belief that planting, pruning, and harvesting should all be regulated by the principles of nature, not the whims of people. By following the lunar calendar, Steiner believed that he could predict particularly advantageous days for picking, pruning, harvesting, and even drinking of wine. This philosophy is said by some to amount to nothing more than holistic gobbledy-gook, but those that believe in it tend to swear by it. We, here at Nirvana Wine & Grillerie, believe that anything that makes a winery make great tasting vintages is worth looking into – and that’s exactly what we’ve found from our wine bar’s selected biodynamic partners. These four pillars represent the basics behind the theory of biodynamics; each of these four “elements” translate into a day based upon the position of the moon within the signs of the horoscope. Basically, it’s a lot like a horoscope for farming that uses the moon’s pull upon the Earth as a means for predicting the best days for harvesting a ripe grape, pruning back a vine, and even creating wine after drawing the grapes back. Those that truly buy into the theory claim that the various days can actually alter the drinking experience of already-made wine. So, if your wine ever tastes a little off, maybe you’re just drinking it on a leaf day, rather than an optimal fruity day! The farmers at a biodynamic winery take this principle quite seriously, which, for better or worse, tends to create some really tasty wine, so who are we to raise a complaint? Demeter, a company based along the west coast, owns the trademark for Biodynamic®, and actually issues certification based upon a farm’s adherence to biodynamic principles. Once certified, farmers can claim that their wine is biodynamically farmed, adding value to wine drinkers in the US and internationally. At Nirvana Wine & Grillerie, we are proud to source many biodynamically farmed vintages, and appreciate the time, effort, and energy that farmers place into precisely planting, pruning, and harvesting grapes for the wine. Today, there are certified biodynamic wineries around the globe, ranging from the US, throughout Europe, and even into Australia. While you won’t taste a difference (that we’re aware of, at least), there is something to be said for the care that biodynamic farmers place on their wine. After all, anyone willing to go through the process of certifying their farm as biodynamic has done nearly as much as they would for organic certification, but in a totally different capacity. This means that you’re drinking a wine from someone that really cares about how their grapes are planted, pruned, and cultivated, regardless of how much stock you place into their exact methodology. At the end of the day, you’ll know that you’re enjoying a glass of wine that was responsibly raised in harmony within nature. If you’re interested in learning more about biodynamics and experiencing the difference that a connection with nature can make on the wine you enjoy on a night out, then stop into our Vernon Hills wine bar to get to know some of the biodynamic vintages we proudly carry. Here, you can enjoy numerous unique vintages and even join our wine club for some truly beneficial perks, for avid wine drinkers and casual tasters alike! Schedule your table with our wine bar and kitchen today!